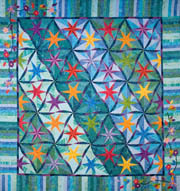 With twenty-six members of Golden Valley Quilt Guild attending, this was our best quilting retreat yet at Zephyr Point. Thanks to Nancy Holinski, her helpers, and to Marilyn Solem-Schultz for the group photo. It was held from May 31-June 5 and a wonderful time was had by all. We were able to complete many projects and UFOS, in spite of much laughter and many shopping excursions.